Limoges porcelain has been made in Limoges, France since the mid-nineteenth century. Fine porcelains were made by many factories including Haviland, Ahrenfeldt, Guerin, Pouyat, Elite, and others. Porcelain was first discovered by the Chinese over a thousand years ago. Now made of pure white clay as the primary substance, the Chinese first used sandstone and stoneware. One of the first Europeans to see porcelain was Marco Polo during his travels to the far east, naming it to reflect the characteristics of a very white and translucent shell. Vasco De Gama brought the first porcelain back to Europe in the 1400s, and trade soon sprang up under the vast network of the East India Company. Louis XIV of France had an insatiable demand for porcelain, and much was imported from China but at a very high price. The Chinese had kept the manufacturing process for porcelain secret to maintain their trade position and its lofty price, but now the French went about discovering the secrets in all earnest. The earliest deposits of the mineral required to make porcelain were discovered near Meissen, Germany during the seventeenth century. Kaolin was discovered in France about 1768, close to Limoges, and gave rise to the Limoges porcelain industry. Underground deposits around Limoges also included metals which had been used to provide metallic oxides for coloring enamel and Faience since the Middle Ages. In 1771, Faience manufacturing was converted into porcelain manufacturing, and the first hard paste porcelain was made in the Limoges region. This first factory established about 1774 became a subsidiary of the royal factory in Sevres in 1784. Following the French Revolution, this governmental influence once again gave way to private interests, and by the early 1800s Limoges was making the finest, purest white porcelain in the world. By the 1830s, there were at least 35 porcelain factories operating in the Limoges region. The latter half of the century was the period of greatest growth and recognition for Limoges porcelain, repeatedly recognized for its quality and innovation in the universal expositions now being organized in various parts of the world. The finest artists migrated to Limoges to practice their art on the fine white porcelain now being produced to international acclaim. 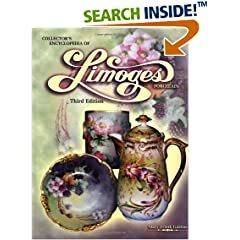 Limoges transitioned almost seamlessly from the Art Nouveau period into Art Deco in the 1920s, and many fine works continue to be produced to this day. Porcelain production is made possible by working various types of clay including Kaolin (provides the white hue and plasticity for shaping), Quartz (a degreasing agent, reducing deformation during firing and contributing to shape retention), and Feldspar (required for glazing and giving porcelain its translucent quality). The raw materials plus other ingredients are crushed and mixed, and the resulting clay is then filtered and sifted. Once a piece has been shaped, it is dried by firing first at temperatures approaching 1000 degrees F, then enameled in a liquid bath, then fired again at approximately 1400 degrees F to reach the fusion point for the materials. The porcelain is now hard and no longer porous, resulting in unsurpassed quality for tableware. Porcelain decoration can be done either via a hand painting in watercolors which are subsequently transferred to the porcelain using a decal process, or hand painted with a paint brush. 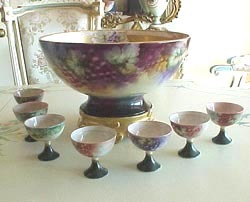 Buy period Limoges porcelain on the Collectics Fine Antiques and Porcelain pages, or search the entire site for great antiques, collectibles, and crafts for every collector!